I’ve just made a replacement in my bookshelf. One of my long-standing favourite photography reference books has been replaced Tom Ang’s compendium – Fundamentals of Photography: The Essential Handbook for Both Digital and Film Cameras. The book is thick: 352 pages, and is packed with information. I’ve seen quite a few photography books over the years, and I think that this one stands out as a rather comprehensive collection of photographic knowledge (or at least as much as can be fit into a single book). Beginners and advanced users alike will find a staggering amount of information, all of it illustrated with interesting and well annotated photographs, illustrations and charts. One would think that such a description would go well with the term ‘Information overload’, but the book does no such thing. It leaves you with enough information to understand a topic and appreciate it’s key points and then moves on. Having said all of that, this book really is for everyone. 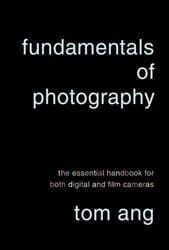 If you’re a newbie who really wants to understand photography, this book will take you where you want to go. If you’re an experienced photographer who feels out of touch with the internet, self-learning and digital photography, this book will bring you back up to speed in the traditional manner – with wisdom in black & white. If you’re a pro, this book cant hurt… I’m sure you’ll find snippets of information that you’ve not seen before… For example, did you know that there are three stages in JPG compression, and that not all of them are lossy? Some of these nuggets of information may just help you squeeze out that extra 2% of brilliance in your photographs. Tom Ang is an experienced author, and it shows. He is also a respected photographer and TV presenter. With 19 titles such as “Tao of Photography “, “Digital Photography Masterclass “, “Digital Photographer’s Handbook: Third Edition ” and “Advanced Digital Photography ” to his credit, you can be sure that he knows what it takes to write a comprehensive book. You can read more about him on his website, and read some his articles and tips on his blog, and on the BBC website. There are a couple of ways in which you can get a copy of this book. Take part in the Beyond Phototips ‘Detail’ Competition and you may just win one. Visit the Publisher’s website and buy a copy. Buy a copy from Amazon.com .